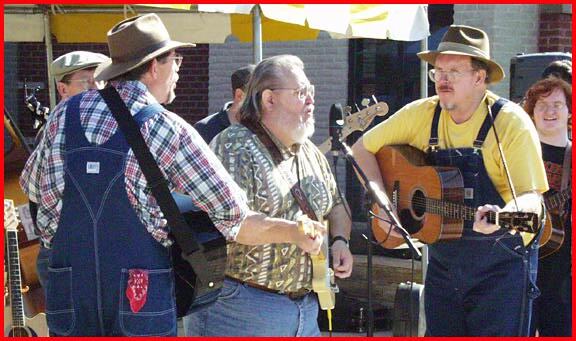 "PICKING AND GRINNING - Rockabilly Hall of Fame Inductee Stan Beaver (in the middle with the Telecaster) did an Elvis number during the 2002 'Festival of Cultures' as a part of the Traditional Music Center's (TMC) concert. He was joined by TMC executive director Jerry Venable, right." Stan's musical career began when he appeared on his Father's TV show in Atlanta, Georgia. He was only 5 years old at the time. He sang "River of Memory" and wanted to say "Hi" to his Mom. He did. Stan recorded a song in 1963 called "I GOT A ROCKET IN MY POCKET" (Petal 1012). This record is now a real collector's item. It is listed in several of the record collector's price guides, including Jerry Osborne's "Rockin' Records" and L.R. Docks "Record Collectors Price Guide". If you have an original copy, it's worth between $35 and $50, depending on condition. "I GOT A ROCKET IN MY POCKET" was re-issued in 1997 in Germany, on a various artists CD called "ROCKET SHIP" (Buffalo Bop - Bb-CD 55052) This CD was made in Germany but it is available by mail order from several companies that import CDs. Stan hopes to have his own CD released soon that would include this and other records he's made over the years. Stan has appeared on stage with many famous entertainers including The Duprees, Faron Young, Johnny Maestro (The Crests, Brooklyn Bridge), Buck Owens and many others. As a recording and concert sound engineer he has worked with many name artists including Emmylou Harris, Tom T. Hall, The Righteous Brothers, Carl Perkins, Ray Charles, Hoyt Axton and many more. In fact, he was the studio engineer for Tom T. Hall's "Toybox" recording studio in Brentwood TN. for almost 3 years. Stan has also been associated with several major motion pictures, as an actor, and as a crew member. His movie credits include "J.D. And The Salt Kid" with Slim Pickens, "ELVIS" with Kurt Russell as Elvis Presley, and "The Night The Lights Went Out In Georgia" with Dennis Quaid, to name a few. Stan even had is own local TV show in Chattanooga, Tennessee for about 4 years called "THE STAN BEAVER SHOW". (so what else would he call it?) He has also produced and/or directed several local TV shows and produced what he called ".....a ga-zillion TV commercials". Singer, songwriter, impressionist, musician, recording artist, TV producer/director. The list goes on and on.